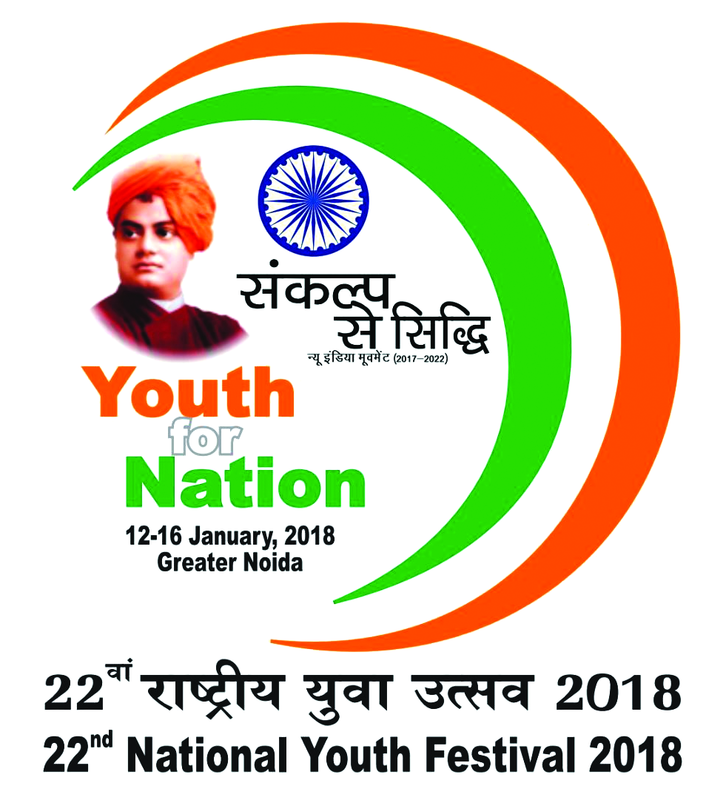 Friends, National Youth Festival is getting started today. I wish, I praise all the youths and institutions who have won National Youth Awards. This is an excellent opportunity to deliberate and make pledges on the issues of a New India. This is the 22nd festival and I would expect that when you people discuss then this issue should also be discussed that when the 25th youth festival will be celebrated then what will be its outline. What kind of pledges will be made? Where will we reach by preparing a roadmap? Friends, our country will complete 75 years of its independence in 2022. You would have read about the freedom struggle in books only. I myself have heard or read about the freedom struggle. There may be difference in our ages but in this regard I'm not different from you people. My young friends, we had not participated in the freedom struggle so it's our responsibility to realise those dreams that were dreamt of by those freedom fighters. It is the responsibility of all of us to fulfill the dream of making that kind of India that our brave freedom fighters used to dream when British police used to lash them and they used to suffer all kind of tortures in those dark jail cells. When we will imagine those dreams, those concepts then we will be able to make a pledge for making the India of their dreams. You should reflect on what is happening around you that you wish to change. Brothers and sisters, Swami Vivekanand used to say that a 'youth is who works in the direction of his future objectives without being concerned about the past'. Whatever things that all of you young people do today that thing determines the direction of the future of the country. Therefore whatever solemn pledges that you will make today, those same solemn pledges will make the country successful after realisation. If you have a clear conscience, if you have a clear objective and strong determination then people will automatically start getting associated with you. Today, I have the same expectation from you that you should not waver before taking your first step, you should not waver before making a new start after making a solemn pledge, you should just make a solemn pledge and start off. The entire government, the entire country is by your side in every possible manner in your journey. I would like that those youth who want to do something on their own, who want to realise their dreams due to their hard work, they should get every kind of help. When they start off then they should not worry about the bank guarantee, they should not worry about tax liability and they should not worry about the multitude of paper work. I expect that the youth of my country should become job creator, he should come forward for innovation and that is why continuous work is being done in this direction. Friends, our government has approved loans to 10 crore borrower under the Prime Minister Mudra Scheme. A figure of 10 crore is very huge. These people have been provided loans worth Rs. 4 lakh crore without any bank guarantee. Just imagine, an amount of Rs. 4 lakh crore has been disbursed to these people without any bank guarantee, without asking how these loans will be repaid. People have started their own small businesses in villages, in towns, in cities and in rural areas. They have been realising their dreams. These people, these small and medium entrepreneurs are now becoming the employment providers. Brothers and sisters, there is only one basis for this massive scheme of the government - faith in you people, trust on the youth of the country. We are confident that when the youth of this country determines something then he can do wonders. Youth who are full of energy are present in every corner of the country. Someone is producing electricity from the small waterfalls in mountains, someone is producing electricity from waste and someone else is producing the construction material from the waste material, someone is providing health services in villages by using technology, and others have set up a food processing unit in his farm. This kind of millions of youth have been working day and night for nation building. You have courage and you also have the wisdom to move in the right direction. That is why the government is making efforts to hold your hands. A little bit of support and rest you people are capable on your own. Friends, the government is also paying attention so that people can get skill training as per the requirement of modern times. This is for the first time that any government has shown this kind of seriousness with regard to skill development. Earlier people used to become silent when they were asked about the difference between skill and education. Brothers and sisters, just reading in the books that how to fly a plane and understanding it's finer details in the book is education. However, flying a plane in real life is skill. If someone just gets the education but no skills then it's difficult to get employment. That is why we have been moving ahead by focusing on skill development. It has been ensured that youths are skilled in addition to getting education. Millions of youths have been trained under the Skill India Mission. The government has been setting up Prime Minister Skill Development Centres across the country. India International Skill Centres have also been set up. The work is ongoing for establishing hundreds of multi-skill training institutes. This is for the first time when the financial assistance is being given to those companies which have been providing apprenticeship to youth. A part of the apprenticeship amount paid by the companies to students has been reimbursed by the government. Under the national apprenticeship scheme more than 7 lakh youths have been registered so far. The government has set a target of providing apprenticeship training to 50 lakh youths in the next two-three years. The work to provide training to youth under the Prime Minister Youth Scheme has been done in more than three thousand institutes. It is the effort of the government to provide training to the youth as per the requirement of the country, as also the requirement of our industry. The skills of people are also being developed while keeping the requirement of foreign countries in the mind. Friends, I have full confidence in the youth of the country, I have full faith in the power of youth power, in the energy of young people of the country. That is why we have focused our attention on that. Friends, some people say that today's youth are impatient. But I say that precisely this thing becomes the cause of innovation in the young generation. There should be patience in life, impatient life is also not correct but this kind of patience is also not required that a person can't think about new things and the life becomes stagnant. There is a lack of patience that is why today's youth has been working at a fast pace, they are innovating and also producing results. Your innovations are related to social concerns be it Clean India Mission or Beti Bachao-Beti Padhao project or be it Waste to Wealth. Nobody can have a better understanding than you people about the challenges and problems surrounding you. The government has started Atal Innovation Mission while keeping this capacity of you people for innovation in the mind. Emphasis has been placed on creating an eco-system for innovation in the schools and colleges of the country. Establishment of nearly 2,500 Atal Tinkering Labs across the country has been sanctioned to increase the scientific temper in the students and also to provide the right direction to their creativity. Atal Incubation Centres have been set up to encourage the innovation-entrepreneurship in sectors like manufacturing, transport, energy, agriculture, water and sanitation. These centres will provide financial assistance to start-ups and will also guide them in the right direction. Brothers and sisters, the start-up India programme is becoming the basis of start-up revolution in the country. The government has set up a start-up fund with an amount of Rs. 10,000 crore. Credit guarantee and tax exemptions are being given to the new start-ups. Government is providing legal assistance to them so that they can get their innovations patented. I am giving you this information because this information will help you to move ahead after you graduate from your colleges. Today, whatever resolutions you people will make this information will help you in realising them. No one will stop you to start your company or your start-up while you are completing your education. Brothers and sisters, it is not necessary that everyone in the world will make progress only when they get facilities. Today so many foreign companies are being managed by the youth from India. They are presidents, chairman and CEOs of those companies. They have left their indelible impressions on these companies. Have they straight away reached to those positions? No. Have they straight away got those high offices on the lines of dynastic style of politics? No. They have worked hard. They have struggled. They had their dreams, they took risk and they had shed sweat day and night only then they had reached there. Indian youths have that capability that wherever they have gone they have brought laurels for the country and for themselves. You have seen that just two days ago Anchal Thakur has won the first international medal for India so far in the sports of skiing. A few days ago Manushi Chhillar had brought laurels for the country. I believe those who are on social media they will be certainly taking the updates on daily basis about where those six daughters have reached who have set off to circumnavigate the world. These are different voyages of achieving successes by making solemn pledges and they have been becoming a source of inspiration for everyone. Friends, today, I will also urge you to make sports part of your life. Sports, in a way, is a medium for getting education which not only makes the body energetic but which also revives your mind. We learn discipline from sports. Playground teaches us the meaning of defeat. Playgrounds teach us to work extremely hard to achieve our target. What is the meaning of team spirit, we learn this thing for the first time in a play ground. Whether we win or lose but the sportsmen spirit that we learn in the playground that remains with us throughout our lives. That is why I say: who played, they flourished as well. You people should also play hard and flourish abundantly. You people should also include Yoga in your lives along with sports. I have been told that you people will do Yoga daily in this youth festival. You people should go back with this practice. You will become physically and mentally strong due to Yoga. My experience suggests that whatever you people will learn in this youth festival, whatever relations that you will develop, these things will remain with you, will be of use to you people for the rest of your life. While wishing all of you once again on the occasion of youth day and youth festival and while again remembering Swami Vivekanand, and also the path shown by him, the path of social harmony, the path for getting rid of the concept of superior and inferior which was shown by him, the path of living and dying for the country which was shown by him, and on the occasion of birth anniversary of such a great soul I conclude my speech with these wishes that you people march ahead with the inspiration, capability and determination of youth.